Even though optical data carriers are in decline in the retail sector, they are still very popular in the professional environment. Unlike in the case of price-sensitive discount stores, the quality of the materials and processing is the focus here, and therefore durability – which for all INCOM-listed products is at least 30 years . There is close cooperation with Falcon (FTI), Rimage and Ritek, so that also special wishes or customised products can be offered. The first priority is always the reliability of the media, both for current operations, such as robotic handling or with for production systems within the printer, and then later for archiving. 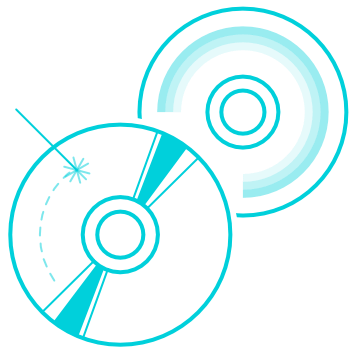 The Blu-ray disc is the latest generation format of optical data carriers, with a current capacity of 100 GB (triple layer). Further developments involving 128 GB (quadruple layer) and double-sided media which double the relevant capacity are already on the starting blocks. The current write speed is x6, which corresponds to a data transfer rate of 27 MB/s. The sensitive data side of the Blu-ray disc is protected by an extremely hard plastic layer which even steel wool has trouble damaging. In a cartridge of 12 bundled media, as sometimes used in HIT libraries, a capacity of 1.2 TB per cartridge is thus achieved. If you have questions regarding storage media do not hesitate to contact us.